Page Police busy Tuesday putting up some new signs out along US 89 at Horseshoe Bend with a very clear warning- do not park or you will be cited AND TOWED. This is the newest attempt at safety there as a result of drivers who refuse to follow the rules and park in the provided alternate lot on US 98 a couple miles away (with shuttle to and from the HSB trailhead), opting instead to park on the highway, clearly marked as prohibited and with good reason. It is very dangerous to park along that highway and now besides getting a ticket, you will also find yourself out of a ride completely when you come back and find your vehicle has been towed back to the towing yard in Page. 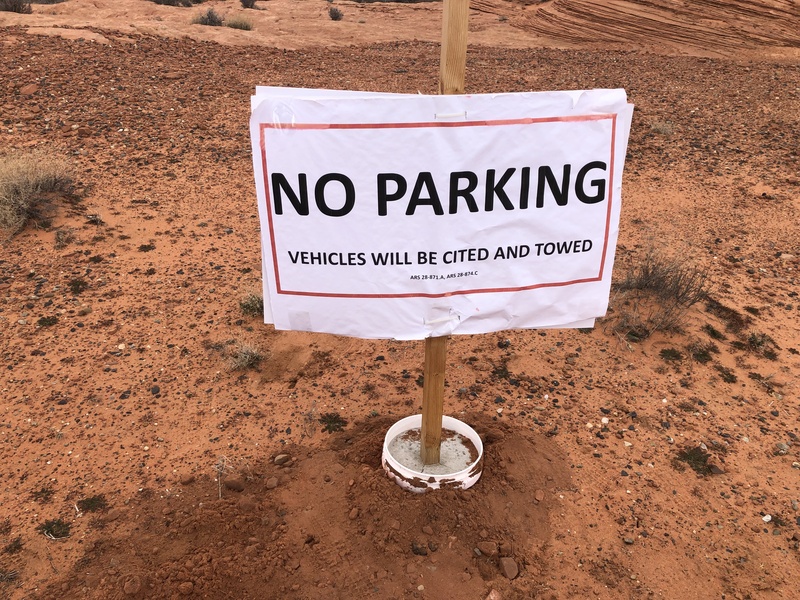 Page Police Detective Terry TerEick tells Lake Powell Life News that the temporary signs are there until some more permanent ones can be made. Police have placed them in some of the bigger problem areas and they are not an empty threat. At least two vehicles have been towed, today. They get towed to Transport Towing’s yard in the industrial park. They are not impounded, so people coming to retrieve their vehicles will just have to pay the fee to Transport Towing. Detective TerEick assured that the tow trucks do a very good job at avoiding becoming a traffic hazard themselves and are equipped with emergency lighting, plus police are always on the scene to direct traffic when they have requested a tow truck. The safety hazards created by vehicles parking along the highway are significant. It is only a matter of time before a tragedy happens. TerEick says the Page Police Department is hoping by aggressively enforcing traffic laws and educating the public on those laws, they can avoid a tragic incident. Visiting Horseshoe Bend soon? Here is what you need to know about where to park, how to ride the shuttle and where you buy the ticket for your ride online.